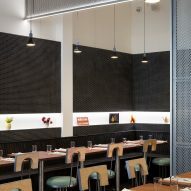 Penny rounds cover surfaces and perforated metal forms partitions at this pizzeria in New York's Lower East Side, designed by Jordana Maisie. Una Pizza Napoletana opened last month on Orchard Street, amid the throngs of eateries and bars found in the Manhattan neighbourhood. 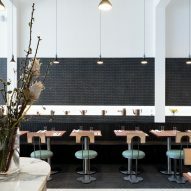 Restauranteurs Jeremiah Stone and Fabian Von Hauske teamed up with Neapolitan pizza specialist Anthony Mangieri for the venture, and asked designer Maisie to create an interior that would complement the cuisine. 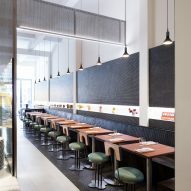 "The primary design challenge for Una Pizza Napoletana, was to create a singular cohesive space that represented two distinct identities: both culinary and aesthetic," said a statement from the team. 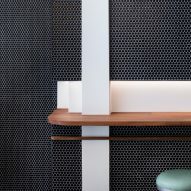 The 1,667-square-foot (155-square-metre) space is divided into two sides, with dark tones used on one and a lighter palette across the other. Both are created with penny rounds – circular tiles that look like coins, tessellated together in rows to create larger surfaces. Matte-black penny rounds run from the door along one wall and a section of the floor, almost the full length of the space. Built-in seating with matching wooden backs follows the dark strip all the way down, with small wooden tables and chairs lined up in front. On the other side, pale-toned penny rounds offer a contrast. A bar wrapped in the tiles occupies the area closest to the street frontage, while more tables and seating are available beyond. Further back still, a partition made from perforated metal cuts the room in half. 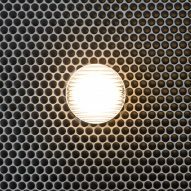 While a gap allows the dark-section seating to continue back, the other side of the screen demarcates the kitchen area, and wraps around its side. A white-tiled pizza oven and other food preparation areas are visible through a window, as is a separate enclosed, temperature-controlled room for making the dough. "Site-lines are curated to frame activity and emphasise the artisanal quality driving the culinary experience," the team said. 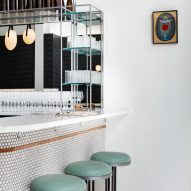 Materials used across the space are predominantly monochromatic, like the marble bar counter, and steel shelving behind that was built in Memphis. 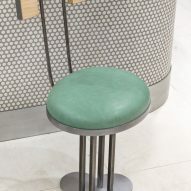 Custom seats and stools have a "deco meets industrial" look, with metal stands and green leather upholstery, and were made in Pittsburg. "All furniture has been custom designed as an aggregate of deco elegance and raw robust industrialism," said the team. 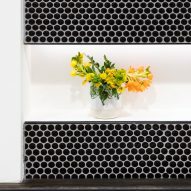 "The resulting design is one focused on craft, depth, vibrancy and material play." 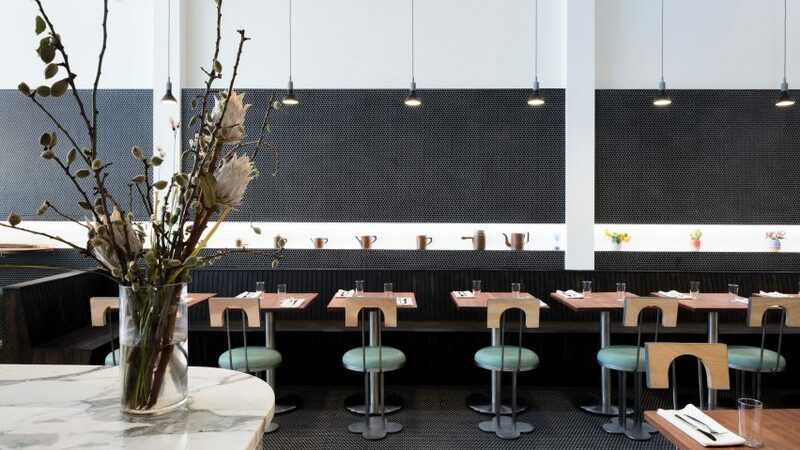 New York has a constantly evolving dining scene, with new spots opening up all the time. 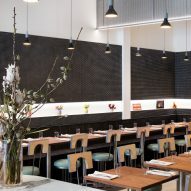 Other recent additions with notable interiors include Italian-American restaurant Don Angie in the West Village and a ramen spot called Tonchin in Midtown.